He will not rat on his partners. This is his bottom line. He will talk to investigators about all the other guys he knows things about. He will talk about how narcotics cops get involved in the narcotics traffic, how they buy information with drugs, how they string out addicts and use them as informers, how they keep some of the money and some of the drugs after big busts. He will tell what he knows about how the other cops do these things. But he will not talk about his partners in his own unit. This is his code, and, of course, he is going to have to break it. 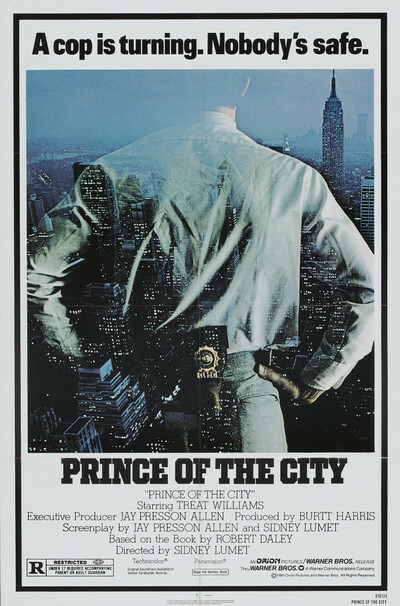 That is the central situation of Sidney Lumet's "Prince of the City." While you are watching it, it's a movie about cops, drugs, and New York City, in that order. After the film starts to turn itself over in your mind, it becomes a much deeper piece, a film about how difficult it is to go straight in a crooked world without hurting people you love. Drugs are a rotten business. They corrupt everyone they come into contact with, because they set up needs so urgent that all other considerations are forgotten. For addicts, the need is for the drug itself. For others, the needs are more complex. The members of the special police drug unit in "Prince of the City," for example, take on an envied departmental status because of their assignment. They have no hours, no beats, no uniforms. They are elite free-lancers, modern knights riding out into the drug underworld and establishing their own rules. They do not look at it this way, but their status depends on drugs. If there were no drugs and no addicts, there would be no narcs, no princes of the city. Of course, their jobs are also cold, dirty, lonely, dangerous, thankless, and never finished. That is the other side of the deal, and that helps explain why they will sometimes keep the money they confiscate in a drug bust. It's as if they're levying their own fines. It also explains why they sometimes supply informers with drugs: They know better than anyone how horrible the addict's life can be. "A junkie can break your heart," the hero of this movie says at one point, and by the movie's end we understand what he means. The film is based on a book by Robert Daley about Bob Leuci, a New York cop who cooperated with a 1971 investigation of police corruption. In the movie, Leuci is called Ciello, and he is played by Treat Williams in a demanding and grueling performance. Williams is almost always onscreen, and almost always in situations of extreme stress, fatigue, and emotional turmoil. We see him coming apart before our eyes. He falls to pieces not simply because of his job, or because of his decision to testify, but because he is in an inexorable trap and he will sooner or later have to hurt his partners. This is a movie that literally hinges on the issue of perjury. And Sidney Lumet and his co-writer, Jay Presson Allen, have a great deal of respect for the legal questions involved. There is a sustained scene in this movie that is one of the most spellbinding I can imagine, and it consists entirely of government lawyers debating whether a given situation justifies a charge of perjury. Rarely are ethical issues discussed in such detail in a movie, and hardly ever so effectively. "Prince of the City" is a very good movie and, like some of its characters, it wants to break your heart. Maybe it will. It is about the ways in which a corrupt modern city makes it almost impossible for a man to be true to the law, his ideals, and his friends, all at the same time. The movie has no answers. Only horrible alternatives.